Possibly one of the most concerning factors associated with climate change is the uncertainty of its impacts on agricultural pests. Climate change can directly influence ranges and severity of pests and indirectly complicate the relationships among climate impacts, pest’s predators, and natural enemies. The complexity of biological and environmental interactions make projections difficult. Several University of Idaho REACCH entomologists, led by Sanford Eigenbrode, are addressing these important concerns by examining aphid dynamics in wheat-based cropping systems. To better anticipate future dynamics of aphids, it is important to first understand past and present population drivers. 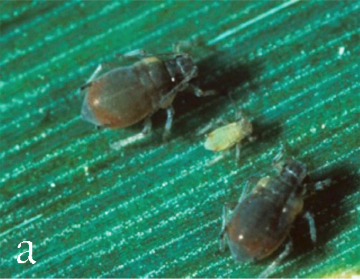 Three common aphid species [bird cherry-oat aphid (Rhopalosiphum padi), rose-grass aphid (Metopolophium dirhodum), and Russian wheat aphid (Diuraphis noxia); Figure 1] pose significant management concerns in agricultural systems. Figure 1. 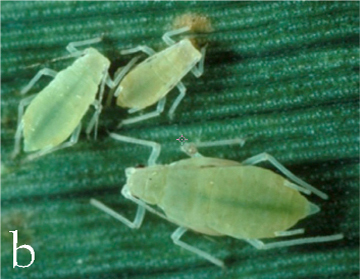 Three predominant aphids examined in Pacific Northwest cereal systems: (a) bird cherry-oat aphid, (b) rose grass aphid, (c) Russian wheat aphid. Photos by (a) D. Schotzko, (b) Lancaster Univ. (c) D. Schotzko. Figure 2. 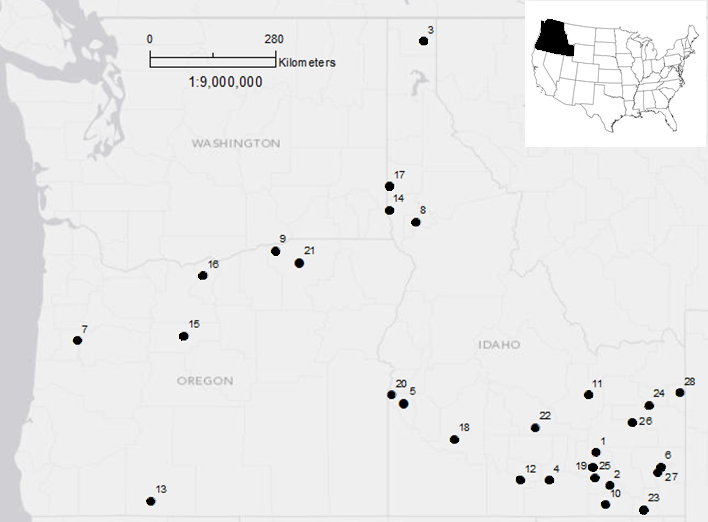 Location of aphid suction traps used in this study. Examination of extensive historical records in combination with annual sampling (Figure 2) provides some insight about their current populations in the region. Total number of aphids varied among sites and years, more than 10 species of aphids were encountered at all the sites including a new aphid species. Pairing capture records with climate models allowed researchers to speculate that D. noxia will become less prevalent in the region, M. dirhodum is likely to increase with annual precipitation increases and R. padi will persist as a pest, irrespective of climate variability. Additionally, aphid species abundance fluctuated annually and is consistent with typical population feedback dynamics (Figure 3). Figure 3. Summary of responses of bird cherry-oat aphid, rose grass aphid, and Russian wheat aphid to temperature and precipitation over a 20-year period in the Pacific Northwest. “With feedback” means that the data analysis included the interannual feedbacks from the effects of natural enemies or competition. “Without feedback” means that the feedback was excluded. In either case, the effects of climatic variables are shown if detected. The upper section refers to annual abundance—total aphids captured. The lower section refers to the estimated peak flight observed during each year. 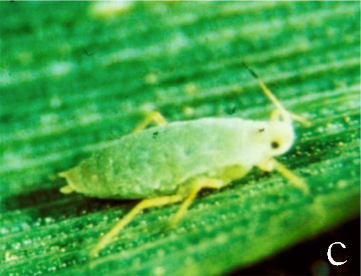 In addition to being pests themselves, aphids can also transfer harmful Barley Yellow Dwarf Virus (BYDV) to cereal crops. But a virus is not all bad news since sometimes “pests” can help crops too. Recent evidence suggests that viruses might actually extend beyond their role as pathogens and provide ecological benefits to plants. 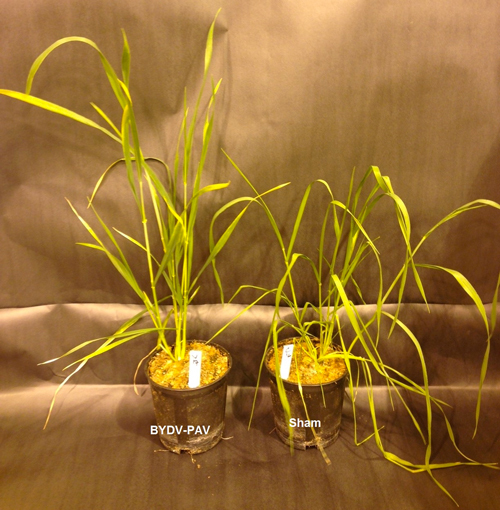 When spring club wheat was infected with BYDV, it retained more water and had delayed symptoms of stress after seven-days of simulated drought compared to non-infected plants (Figure 4). 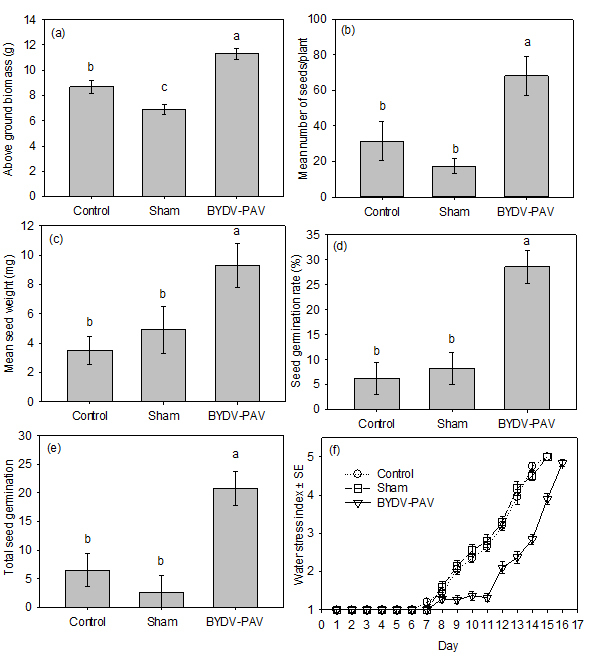 BYDV infected plants also surpassed uninfected control plants in biomass growth and seed development (Figure 5). Figure 4. Triticum aestivum cv. 'JD' following a challenge with seven days of water scarcity. Infected plants were visibly more turgid and robust at the end of the experimental period. Photo by Seth Davis. Figure 5. Wheat responses following a 15-day water withholding and recovery period. Panel (f) shows a time series at the onset and progression of visual water stress symptoms in wheat following water withholding. These results suggest that environmental factors may mediate disease responses and favor coexistence under stress. Researchers hypothesized that the drought response resulted from the crop’s stress hormone pathway and are examining its implications for application by wheat breeders to select for drought resistance. Although insect dynamics continue to challenge scientists, understanding present drivers and typical population dynamics may give some indication about what their populations will be like under future climate scenarios. Some responses like annual species abundance appear to be consistent, while others like a specific aphid species response to a specific climate driver might vary. However, understanding the components that make up these dynamic relationships can help scientists evaluate how these complex interactions can promote agro-ecological resilience under environmental stress. Contributors to Aphid Research include: Sanford Eigenbrode, Nilsa Bosque-Perez, Seth Davis, Ebrahim Sadeghi, Brad Stokes, Nate Foote, Troy Magney and John Abatzoglou.